One of the leading figures of American Pop art and an early pioneer of environmental and installation art, Oldenburg reveals in his works the hidden potential of everyday objects, making them tangible, soft, and humorous. Oversized foodstuffs such as an ice cream cone or baked potato, often rendered in a somewhat unpredictable way, are frequent elements in his vocabulary. Since 1976, Oldenburg has collaborated with Coosje van Bruggen. Together, they have executed more than forty large-scale projects, which have been installed in various outdoor locations throughout Europe, Asia, and the United States. The perishability and vulnerability of the decaying apple core evinces Oldenburg's consistent preoccupation with the process of decline and death. It is also the residue of a natural ("perfect") form altered ("spoiled") by human intervention. The existential imperative of growth and decomposition - its poignancy once heightened by the lushness of vanitas pictures, with a worm or insect accentuating the moralizing intent - is ironically underscored in Apple Core by both the mock-heroic scale and the "organic" coloring. 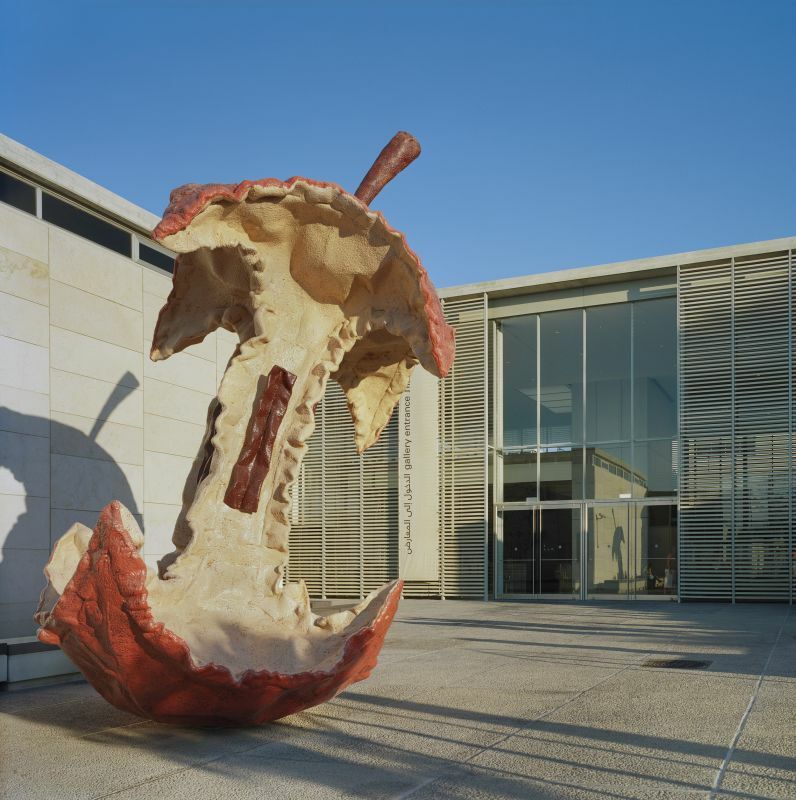 Ultimately, these very elements, enhanced by tongue-in-cheek sculptural-painterly effects and hard-soft punning (the "rotten" apple has an actual steel core and is fashioned in stiffened urethane foam), make Apple Core an endearing rather than forbidding piece, inviting tactile exploration. The apple motif is allusive in many ways. Voluminous and sensuous, it graces innumerable still-life compositions, but it is also traditionally pictured as the forbidden fruit - an association that will not be lost on visitors to the Jerusalem Garden of Art.